The Flatbed 201 is designed to complement the Canon document scanners, providing users with the flatbed scanning option along with our DR-series document scanners. 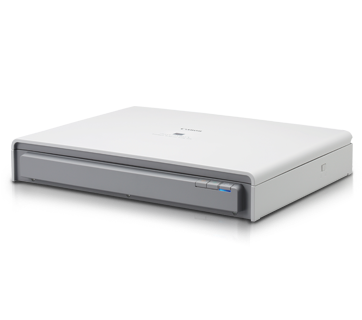 * The Flatbed Scanner Unit 201 needs to be used with a DR-series scanner; it cannot be used independently. Connect the flatbed scanner unit to a Canon DR-series document scanner via simple USB connection. Scan documents with Canon DR-series scanner connected and save the images as a single file with the ease and seamlessness of a single-scanner operation. The Flatbed Scanner Unit 201 lets you scan documents such as books, magazines, and passports. It also allows scanning of documents that are larger than A4-size, and can be used to digitize selected pages from a bound document.